While some people are content decorating their New Year tree with modern ornaments, collectors rave about antiques from their childhoods that tell a bigger story about Soviet-era history. Antique Christmas tree decorations are back in vogue. Ogoniok magazine talked to collectors to find out more about the trend and the ornaments themselves. My collection started with a family accident: when I was 14, a cat knocked over our New Year tree, and our favorite ornaments – the ones my parents had when they were kids – were broken. I decided to find identical decorations: I talked to our relatives and acquaintances, went through numerous flea markets, and as a result, I ended up with many more ornaments than had originally been destroyed. This is how my collection – which I would like to make the core of a Museum of Christmas Tree Ornaments in Moscow – actually started. Additionally, I visited many New Year tree decoration factories and went through their archives to get some insight into their historical product range. I can tell you: decorations used to be made to the highest quality standards. They were, as experts would put it, sculptured, finely wrought, with filigree embossed lettering and ornamentation. I have been collecting Christmas tree decorations to let visitors at my exhibitions remember their childhood and re-experience the happiness, which is, after all, what childhood is all about. This is how my collection started: I took out all our old New Year tree decorations, the various hand-blown glass cucumbers and tomatoes, when my kid was growing up and I was thinking of what other educational toys I could give him. This is how I got fond of New Year tree decorations, and the fascination evolved into collecting. Our country has a unique history of Christmas tree ornaments – they actually illustrate the progress of aircraft building, the development of the Arctic and space. In the Soviet Union, they made whole series of fairy-tale based ornaments: for instance, while the Doctor Aibolit set was widely popular, it would be impossible to find two identical sets. The reason is actually very simple: they poured new paints into the tubs as shifts changed, so different sets were in different shades. During summers, when there was no rush to finish the ornaments to “meet the plan,” the ornaments were painted with more accuracy and refinement. In the 1990s, Russia was overwhelmed with the western fashion to decorate New Year trees in a single style. As people turned to the new trend throwing away their old decorations, I realized that if I did not start collecting them, the treasures would be lost and there would be nothing to show our kids and grandkids. 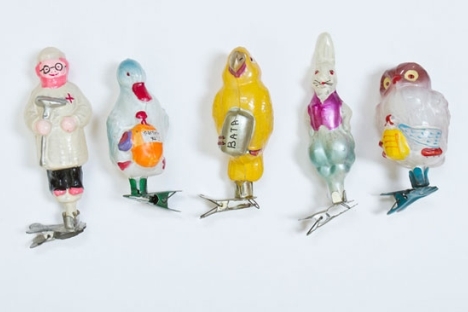 I was a kid when the New Year tree ornament making was at its most developed – in the 1950s. Back then, people had New Year traditions that have largely been lost. They brought ceiling-high freshly cut New Year Trees, and put the Grandfather Frost under it; kids would visit each other to have a look at the trees: although they bought the decorations in the same stores, everyone had a different-looking tree because the choice was so great. My collection features many different Father Frost figures. For instance, I have some produced in Ukraine wearing red shirts and blue pants, and even a mustache of a Zaporozhye Cossack. I have been displaying my collection at different exhibitions, and people come there to relive the memories of their childhood: old ornaments are very emotional and moving – something we lack nowadays. I am a relative newcomer in collecting Christmas tree ornaments. In the recent years, many people fell for collecting, and the competition for antique Christmas tree decorations is great. Unique ornaments are fairly expensive, just like any other antiques. Personally, I am more interested in pressed cotton wool and cardboard creations, which are fairly difficult to find now. To top it all, the market is now swamped with modern fakes, which are hard to recognize even for an experienced collector. I like the series of ornaments which reflect our country's history: for instance, before World War II, they used to make cardboard toys – Red Army soldiers, tractors, vehicles, dirigibles, I have them all in my collection. I hope to get hold of Metrostroy [Metro-development organization] ornaments since I work in this sphere. The decorations are very rare. I have read about them, but have never laid my eyes on them.